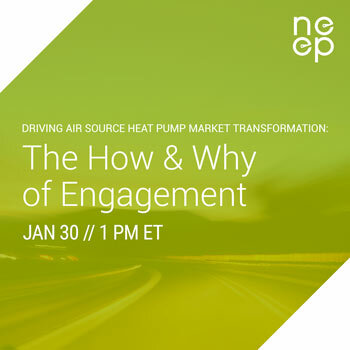 Webinar held on January 30 at 1:00 p.m.
NEEP recently announced new developments in its Air Source Heat Pump and Smart Controls initiative, including a new product listing database with enhanced access to efficient products and a subscription model to increase engagement in our market transformation efforts. NEEP’s initiative includes many other activities that complement the specification and product list (all details in our project brief). All parties with an interest in the air source heat pump market are invited to listen this webinar to learn how their organization can get involved. Manufacturers, installers, program designers and administrators, utilities, and consultants are important stakeholders. The webinar recording can be accessed here. More questions? Check out our FAQ and Subscription page for more details. Driving ASHP Market Transformation: Introducing NEEP’s new Product List and Subscription Program on April 17.